With every successful launch, SpaceX takes another step toward the day when we can all marvel at a manned mission to Mars. SpaceX is celebrating the textbook deployment of one of its largest satellites yet. The successful mission of yet another Falcon 9 rocket means it’s full steam ahead for SpaceX’s plan to significantly ramp up its launch schedule to once every two to three weeks. 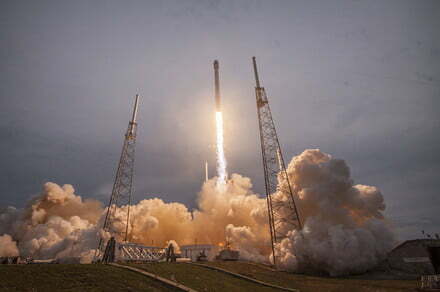 SpaceX’s most recent launch, which carried a satellite the size of a double-decker bus, took place at the Kennedy Space Center in Florida on Monday night at just after 7.20 p.m. local time, and was live-streamed on the SpaceX YouTube channel. Sadly, there was no chance this time around to enjoy the spectacle of yet another stunning rocket landing. The satellite’s heavy launch mass of about 6,100 kg (13,400 pounds) meant the Falcon 9 needed all of its thrust to get the satellite to orbit, plus it went into a much higher orbit than previous launches, leaving it with too little fuel to get back to Earth. The seven-meter-long satellite — operated by British telecoms firm Inmarsat — was deployed about half an hour after launch before being “maneuvered to its geostationary orbit, 22,236 miles (about 36,000 km) above Earth, where it will deploy its solar arrays and reflectors and undergo intensive payload testing before beginning commercial service,” according to SpaceX. Those solar arrays are enormous, too, stretching out more than 130 feet — about equal to the wingspan of a Boeing 737 aircraft. The satellite will boost the power of Inmarsat’s Global Xpress network, which has been delivering broadband connectivity across the world since 2015. Monday’s launch marked the sixth SpaceX mission of 2017 and paves the way for Elon Musk’s private space company to significantly increase its launch schedule. Its next mission is set for June 1 when it will take supplies to the International Space Station (ISS). Despite a few major setbacks along the way, the team has made impressive progress with its reusable rocket system, which is helping to drastically reduce the cost of space missions. Future plans include taking astronauts to and from the ISS using its Dragon crew capsule and a “tourist trip” around the moon, though its lofty long-term goals include a manned mission to Mars.